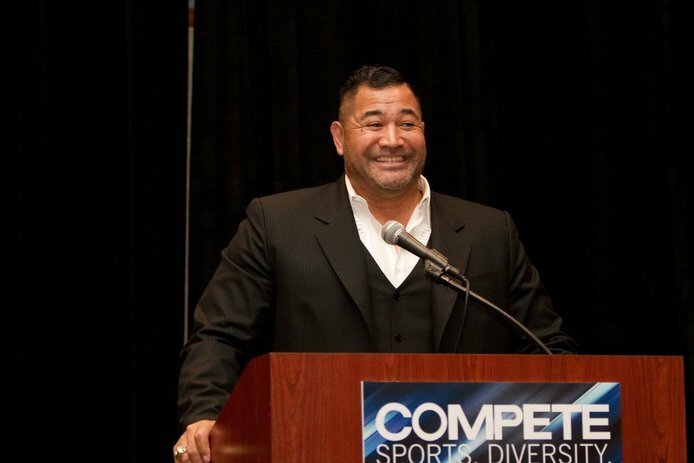 Since Esera Tuaolo retired from a nine-year career in the National Football League (NFL) and came out openly as a gay man in 2002, he has spent the last 15 years speaking out against homophobia in sports. 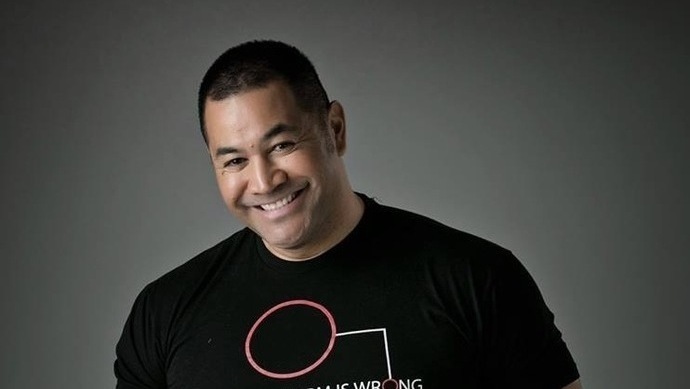 But with his win during the blind auditions for this year’s 13th season of the NBC program “The Voice,” and then winning his battle and knockout rounds the following weeks Tuaolo has gained an even bigger voice for diversity, acceptance and equality in the sports world and beyond. As a 6-foot-4, 300-pound defensive lineman, no one could deny he looked the part of a rugged NFL player. But born in Hawaii of Samoan origin, music has always been part of his life and he had always envisioned music as his career following football. With a voice as big and powerful as his body, Esera is known for singing the National Anthem at various NFL games and other functions. I met him in 2014 when he attended our annual Compete Sports Diversity Awards. We awarded him our Compete Legacy Award and when he sang the National Anthem, in addition to being deeply touched, we were in awe of his vocal power – it was an amazing experience. Now as then, Esera is proud to have come out as LGBTQ for his children’s sake as well as his own. He and his former partner had a set of twins and wanted to raise them in a world where people could love and be loved for who they were; they wanted to be seen and appreciated as a loving family, just like straight people were entitled to. That love for his children and family has never changed. In fact, during Esera’s interview for “The Voice” and during the blind audition, his now 19-year-old twins Mitchie and Michele were there with their dad, cheering him on and dissolving in tears when he won. For Esera and his family, love is love! In 2006 Esera’s book, “Alone in the Trenches: My Life as a Gay Man in the NFL” was released, recounting how he had to live a lie to fit in that macho world of pro football. Some of his former teammates even admitted that had they known he was gay, they’d have tried to injure him so they wouldn’t be viewed as also being gay in a “guilt by association” scenario. And when you talk with him one-on-one, his emotions around that time are still palpable. Raised in an Assembly of God Pentecostal Church which looked at homosexuality as a sin or curse, Esera particularly likes to share his personal experiences with religious groups, using his knowledge of the Bible to counter their homophobic views based on their narrow religious interpretation. Yet for all he’s faced, his message is still one of tolerance, acceptance and inclusivity, the very hallmarks of the sports diversity movement. He doesn’t consider himself a hero, though; he sees himself as a servant of the movement. Reflective of his strong religious background, Esera recently said that as servants we don’t do things because we’re required or obligated to do them; we do things because it makes the world a better place, because it’s the right thing to do. He shared with me that his life’s goal is to educate people, to help create a world for his children where sexual orientation will never hinder them reaching their full potential. Now that he’s a contestant on “The Voice,” one of television’s most watched shows, his voice has been given an even larger platform for his ongoing dedication to eliminating homophobia in sports and beyond, giving all our children a better world. Gay Games 2022 in Hong Kong: What Should We Expect? MLMs Are Bad For You, Mmkay?